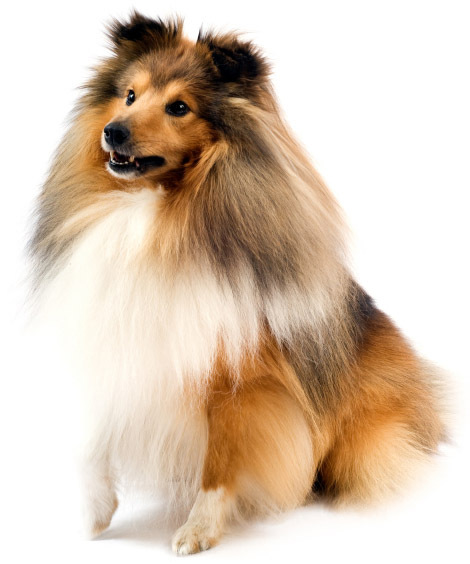 Learn about the temperament and personality of the Shetland Sheepdog. Discover what he's like to live with, his traits and characteristics and how he generally behaves. And look at lots of Shetland Sheepdog photos. The Shetland Sheepdog, affectionately called the "Sheltie," is one of the most trainable and loving breeds there is. They are incredibly intelligent and in tune to their owners thoughts and moods. They can be almost psychic when it comes to knowing what you are feeling. If you want to play, your Sheltie is ready to play. If you are sad, your Sheltie will show concern with a worried look and a few kisses. If you are not in the mood, your Sheltie will give you your space. They are sensitive and responsive to training, and sometimes respond to commands before they are given. They are one of the top breeds in the obedience ring, but they also excel in agility, herding, and flyball. They need a moderate amount of exercise every day, and they are happiest when they get this exercise outdoors. They are a working dog and they need a job to do. They need something to occupy their minds. If you don't give them something, they will think of something on their own, which is usually not a good thing. They are also devoted companions and family dogs and are especially fond of children. They will want to be involved in everything you do and go everywhere you go. They will follow you from room to room, including the restroom. They are also protective, especially of "their" children, and will bark a warning whenever someone nears your door. They are sound sensitive and bark at all strange sounds, even the ones you never hear. Barking can be a problem with Shelties, as they seem to have a lot to say. They are very expressive and talk to you with whines, groans, grunts and a thousand different barks. (They can also smile.) Not only will they bark at you, they may also try to herd you. But it's not personal. They will also try to herd children, bicycles, joggers, cars, ducks, and sometimes airplanes. They are usually naturally distrustful of strangers and should be socialized early in life. They are safest in a home with a fenced-in yard. They are peaceful other dogs and animals. A Sheltie needs to be a part of the family. They are an intensely loyal dog and will not do well if left alone. They love their families and crave human interaction. Owning a Sheltie is a 24-7 endeavor. They love attention. They love to learn. They love to please you. They also love to bark and to steal food from your children. The Shetland Sheepdog is the most intelligent and easiest to train of all dog breeds! He learns new commands quicker than any other breed, which makes him very easy to train. The Shetland Sheepdog is a very heavy shedder. He sheds an awful lot of hair! You'll find hair all over your home, stuck to everything! You'll probably even find it in the butter!